Cook shrimp in a medium pot of boiling hot water until they are an orange color. When shrimp are done, transfer to a bowl to cool. Once cooled, horizontally slice shrimp in half and place in refrigerator until ready to use. Cook noodles according to the directions on the package. Once done, transfer to a strainer and cool. Lay rice paper down on a working service. 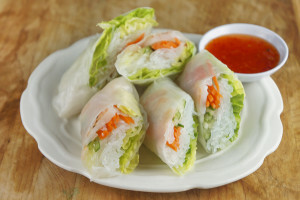 Layer lettuce, noodles, carrots, cucumbers, then shrimp in center of rice paper. Fold bottom flap up, then fold sides in. Continue rolling until sealed. Repeat steps 3 and 4 until you are finished with all of your summer rolls. Serve with dipping sauce.